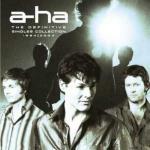 The collection of a-ha singles "The Definitive Singles Collection 1984|2004" will be released in the UK on 11 April. Although similar, in cover design and track listing, to the European "The Singles 1984|2004" release, the track list varies slightly. In place of "Move To Memphis", "Minor Earth Major Sky" and "Forever Not Yours", the UK release includes "You Are The One" and the video for "Take On Me".